← January 23, 2015 – Who are you? Sometimes, when one suffers from depression, or one’s life is filled with a series of unfortunate events most of which one did not serve as agent in causing, uplifting little messages can be irksome as all get-out. Occasionally, Motivating Giraffe’s cheerfulness in the face of my latest disaster has been, to me, unwelcome. But he has worn me down–or up. How could one not love his spirit? His cuteness? And even if I am Charlie Brown and the football and the world my Lucy, I live by Motivating Giraffe’s credo: Keep kicking. Who knows? Maybe my leg will strengthen. Maybe Lucy’s arms will weaken. Maybe I can flatter Lucy enough to distract her and whomp that ball. Or maybe I can run at Lucy INSTEAD of the ball. 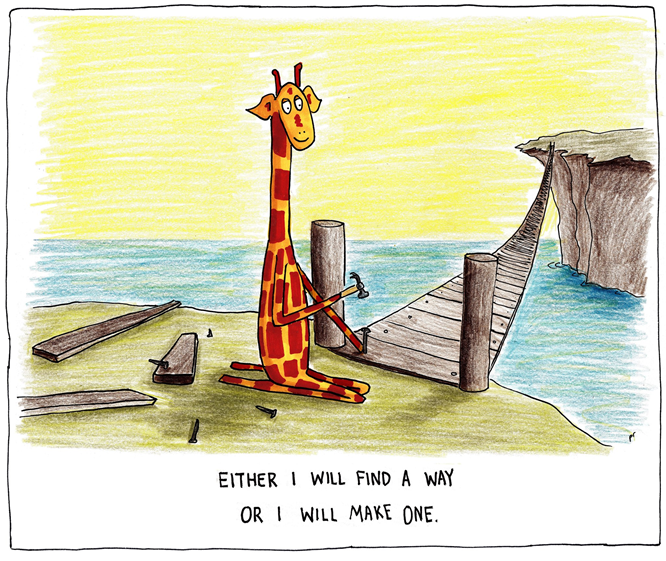 Tomorrow, I may be on my back again, staring at the sky, but today, Motivating Giraffe has inspired me. I wish you all the best, with whatever is going on. Take care of yourself my friend and good luck. That is one inspirational giraffe! Either way. That’s the attitude! Love this sweet giraffe! I’m definitely coming back for my daily dose of motivating giraffe. :) Thanks for following my blog! These are all so darling. Thanks Penny! Sweet reminders of inspiration.